I grew up watching the Jetsons. I loved the technology that we saw there and looked forward to the day that we all had video phones. It took a while, but that day is here now. If you have an iPhone you’ve been able to use Facetime for several years. Now, with Google Hangouts, the rest of us with Windows or Android devices have video-phones at our fingertips. But Google Hangouts takes the technology even further with up to 10 participants in private hangouts, and a broadcast capability that allows hundreds or thousands to watch a hangout live. The other feature, that is so important to us, is the ability to broadcast our screen instead of our face. That way, we can present our seminars using this technology. We’ve been playing with Google Hangouts for a while. It’s just so cool. We’ve had good experiences with it and we’ve have frustrating failures. Last week we said, “It’s time” let’s jump in to the deep end and try doing a public webinar using Google Hangouts on Air. So we did! And it went well. We had about 125 people watching for at least some of the hour-long seminar. The speakers included me (Chris), Jim, and our friend Laura Baker. Jim and I were in our motorhome parked at Thousand Trails Orlando. Laura was also at Thousand Trails Orlando, but she was in her motorhome on the other side of the park. The topic was using Picasa and Send Out Cards to use your pictures and make your own Holiday cards. Another feature of the Hangouts On Air is that the broadcast is automatically recorded and viewable using Youtube. 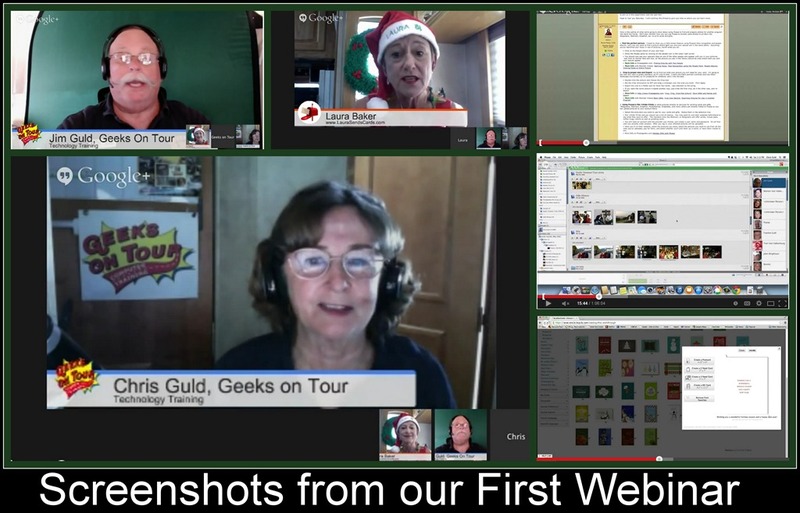 So, if you missed it, you can watch our Picasa and Send Out Cards webinar on Youtube now. Thanks so much for this webinar. Learned a lot and great fun! Merry Christmas to you all! I thought the webinar went great yesterday. I had no problem joining the webinar or viewing any of the content shown. Good information and ideas as well. Loved the webinar! Already sent my 2 freebies [at www.laurasendscards.com] while it was fresh in my mind. No card store where I live. Will certainly consider this option. I thought the sendcards.com was very user friendly. Thanks! If you don’t have time to watch the webinar, we also made “Quick Notes” on the content of the webinar. So, with success like that, we want to keep the momentum going and we’ll do another Hangout On Air webinar next week. Just Jim and me this time, and we’ll try to make it shorter. We’re going to teach making Collages with Picasa. If you are a Geeks on Tour Member, you can learn how to make collages by watching the videos on our Collage Short Course. Back to the Jetson’s … I’m still waiting for my flying car!